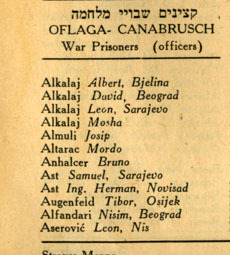 A list of Yugoslavian Jews liberated from various camp at the end of World War II. 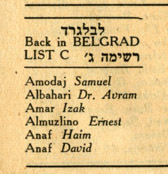 The list was submitted to the World Jewish Congress in June, 1945. Please enter the following in the appropriate fields: Surname, Given name, age (usually only given for children) and town of origin. If a field is missing or unclear, enter a ? in that field.